Telescopes are your window to the stars, and it doesn’t matter if you are a beginner wanting to get a closer look at the skies or a professional astronomer studying the universe, the right telescope is out there for you. There are infinite options out there and choosing one can seem tricky, but we have made it much easier for you! 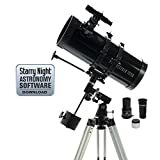 Whether hobbiest or scholar, this telescope buying guide will give you all the information you need to compare and find the right telescope for you. 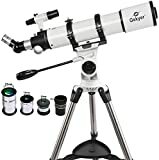 Refractor Telescopes: Refractor telescopes, the most common type of home telescope, use an objective lens to gather light which is then focused at the eyepiece. With good image contrast, these professional telescopes offer high quality imaging. Their long focal lengths allow for less expensive eyepieces which make them good value for your money options. Reflecting Telescopes: Differing from refractor telescopes, these telescopes use concave mirrors which receives the light from the tube and then bounces it off a secondary mirror to the eyepiece. Reflecting telescopes are the most cost effective telescope, are very easy to set up, and their short focal length make them the more compact and portable option. 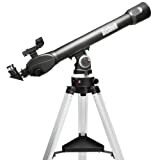 Ideal for the hobbyist, they come either on a Newtonian tripod-mount, or mounted onto a small base that swivels, referred to as a Dobsonian reflector. The size of Dobsonian reflectors means they can have much larger mirrors. 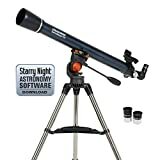 Schmidt-Cassegrain Telescopes (SCT): These compact telescopes use mirrors and lenses together in one compact tube and are a good value choice. 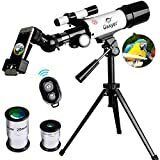 As they can be computer driven, they are gaining a lot of popularity and have a wide range of accessories you can add to have the most fun and get the most function out of your telescope. Smart Scope Telescopes: All three telescope types offer a smart telescope option. Smart telescopes come with built-in computers which cleverly point the scope and find objects for your gazing without much assistance from you. Ideal for beginners and serious astronomers alike, this telescope easily helps you with your sky discoveries. Set-up: Telescopes that are simple to assemble, with clear instructions, and that are easy to tweak are rated much higher by reviewers. Checking the reviews of the best brands will help you to find one that is not difficult to set up and operate. Viewing: Telescope owners want the best viewing quality out of their telescopes, even in conditions that are not optimal, and rate their telescopes highly if they work well in suboptimal conditions (such as areas with lots of light pollution). Consider the aperture, focal length and f/ratios of a telescope before making your purchase to prevent buyer's remorse. 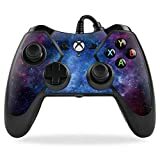 Accessories: Accessories are important to consumers, and they rate telescopes that have accessories included or available better, particularly if those accessories are of high quality. The most popular accessories are moon filters, solar filters, and a Barlow lens. Stand: Telescopes that include a solid base or tripod with easy, smooth adjustment are favorites. This is an important consideration if you don’t want to end up with a spinning, unstable telescope. Choosing a top brand model with good reviews will ensure you are buying a quality product. Aperture is the most important spec to consider when choosing your telescope and will be determined the diameter of the lens. The higher the aperture, the sharper and brighter your image will be. The next thing to consider is focal length. The focal point/aperture ratio (f/ratio) will affect image quality at higher magnifications. Generally the higher the f/ratio number, the better the images that you will get at a higher magnification. When choosing magnification capabilities, you can count on between 20x and 50x magnification per inch of aperture for the optimum results. That means the wider the lens, the higher the magnification your telescope can reach before pictures become grainy and fuzzy. For beginners and enthusiastic young stargazers, look for good value and portability. A 2.4 - 3-inch refractor or a4 - 6-inch reflector is the perfect choice to get you started. If you are looking to upgrade and take your hobby to the next level, a smart telescope will help you search for buried treasure in the sky easily and efficiently. 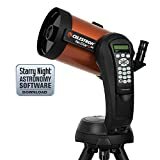 If you are a little bit of a star gazing enthusiast and like searching for things in the sky, choosing a cheaper more portable telescope without computer controls would be a good option for you as you can take it whenever and wherever you fancy. Don’t forget to think about where your telescope will be stored and where you will be using it! If space is an issue, then choose a compact light model. If you have a professional purpose and ample space, then size won’t be an issue for you. A Barlow Lens is a great accessory to consider buying either included with or at the same time as your new telescope. Its purpose is to multiply your eyepieces power, increasing magnification by up to 3 times. It is always advisable to have a few eyepiece options. Multiple eyepieces will offer varied magnifying power and add some versatility to your telescope. The size of an eyepiece's barrel can indicate a telescope’s quality, and anything at a width of 1 ¼ inch or larger is considered a good quality telescope. A moon filter will provide contrast enhancement and glare reduction to your telescope when viewing our nearest neighbor. A solar filter on your telescope will enable you to view the details of the sun directly and safely, allowing you to study sunspots and granulation on the surface of the sun. Once you have chosen your new telescope, a lot of your local planetariums offer courses on how to use telescopes. 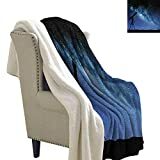 This is a great way to get to know your new stargazer and will enable you to use it to the fullest. A good pair of binoculars could be a nice addition to your telescope or, depending on your needs, provide an alternative to using to a cheap low-quality telescope model. Orion: Orion Telescopes & Binoculars began in 1975 and offers telescopes for everyone from beginners to experts. Their name is so synonymous with home telescopes that even their website is telescopes.com. Celestron: Celestron has been producing telescopes for 50 years and now has more than 80 employees. Their SkyProdigy model was the first smart telescope, capable of generating a list of the best stars, planets, and nebulae visible to the user based on their exact location.